Andrew Gillum, who tried to energize Florida’s young and minority voters through a Democratic coalition seeking to end two decades of Republican control of the governor’s office, ended his hard-fought campaign Saturday as the state’s first black nominee for the post. Gillum, whose refrain had been “bring it home” as he recounted stories of growing up poor in the state, concluded his campaign with a Facebook video he recorded alongside his wife in a park. Gillum, just 39 years old, earned national attention and financial backing from well-known liberal billionaires with his first bid for statewide office. He ran on a liberal platform that included expanding Medicaid and raising taxes to spend more on education even though both ideas would have been hard to pass through the GOP-controlled Legislature. His final act as a candidate was less confrontational than that of another prominent African American candidate in this year’s midterm elections: Stacy Abrams in neighboring Georgia ended her campaign for governor on Friday, ceding to a Republican with an unapologetically indignant tone establishing herself as a leading voting rights advocate. Gillum’s concession came hours before Florida’s counties must turn in their official results at noon Sunday after tense days of recounting ballots in both the gubernatorial and a U.S. Senate contest — two nationally watched midterm elections that have keep the presidential swing state on edge since Election Day. Gillum’s brief remarks came hours after President Donald Trump, who at one point in the campaign had sharply criticized Gillum, praised him for running a tough race. “He will be a strong Democrat warrior long into the future - a force to reckon with!” said Trump in a Twitter post. Gillum had initially conceded to DeSantis on election night, but he retracted it as the razor-thin margin between the two candidates narrowed. But he still trailed DeSantis by more than 30,000 votes following a legally required machine recount. Counties are wrapping up a hand recount this weekend and must submit their official results by noon Sunday. Gillum’s concession assures Florida Republicans will retain their grasp on the governor’s office since Jeb Bush’s term starting in 1999. DeSantis, 40, was considered an underdog before Trump tweeted his support for DeSantis in December, a month before DeSantis even entered the race. Trump campaigned to help push DeSantis to a primary victory in August and visited Florida two more times to help the Republican in the final days of the election. DeSantis’s campaign did not respond to Gillum’s remarks, pointing instead to a statement the former congressman put out two days ago. DeSantis stumbled out of the gate after winning the Aug. 28 primary, telling Fox News that voters shouldn’t “monkey this up” by electing Gillum. Despite implications that DeSantis is racially insensitive — an idea he angrily disputed during a debate — he is poised to officially win the state that Trump carried in 2016. He has promised to keep intact many of the same policies on education and health care that have been in place by previous Republican governors. DeSantis ran as a political outsider despite serving three terms in Congress and running for the U.S. Senate in 2016 before dropping out of the race when Republican Sen. Marco Rubio decided to run for re-election. DeSantis is a former Navy officer who graduated from Yale University before getting his law degree at Harvard University. He gained name recognition during the primary with more than 100 appearances on Fox News, often to defend the president. DeSantis ran a largely negative campaign, calling Gillum a socialist and saying he oversaw one of the most corrupt and crime-ridden cities in the state. Trump joined in on the criticism, tweeting similar messages. The corruption allegation stemmed from a continuing FBI investigation into City Hall that Gillum has said he is not a target of and is cooperating with; the charge that Tallahassee had the state’s highest crime rate was false. Gillum portrayed DeSantis as racially divisive, repeatedly pointing out his “monkey this up” comment. “I’m not calling Mr. DeSantis a racist. 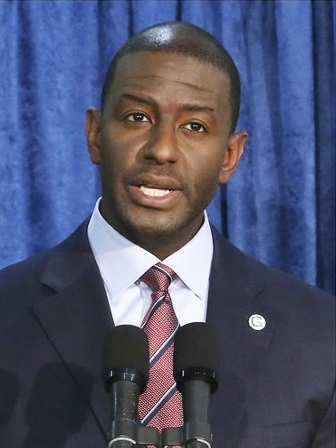 I’m simply saying the racists believe he’s a racist,” Gillum said previously. Gillum’s announcement came as most Florida counties were winding down their hand recount in the state’s contentious U.S. Senate race. The smattering of results publicly posted Saturday showed that Democratic U.S. Sen. Bill Nelson was only gaining a few hundred votes in his bitter contest with outgoing Gov. Rick Scott, a Republican. State officials ordered a manual recount earlier in the week after a legally required machine recount showed that Scott led incumbent Democrat Bill Nelson by about 12,600 votes. More than 8 million voters cast ballots in the race. Nelson and Democrats filed several lawsuits following the close election, challenging everything from the state’s signature mismatch law to deadlines for mail-in ballots. If the 76-year-old Nelson loses, it would likely spell an end to a lengthy political career that stretches back four decades. Nelson was first elected to the U.S. Senate in 2000. A win for Scott would mark his third victory since the multimillionaire businessman launched his political career in 2010. In each race, Scott has barely edged his Democratic opponent. State law requires a machine recount in races where the margin is 0.5 percentage points or less. Once that recount was complete, if the differences in any of the races are 0.25 percentage points or less, a hand recount is ordered. Local canvassing boards only review ballots where a vote was not recorded by voting machines.